Yesterday was a great day in the gym. I taught cardio kickboxing classes all day and had a chance to workout myself. Yesterday was the day I went without the Prodigy supplement to see if I noticed a difference. I had an intense 1 hour workout as usual. 30 minutes of it was done on the power plate with a combination of kicking and punching and the other 30 minutes was done on the floor with more kicking and punching. The intensity I must admit didn’t feel as high as the days I used the Prodigy supplement, but I definitely broke a sweat and went hard. I just feel like I didn’t have the same energy hitting the bags and doing my workout. I don’t think it was a bad workout at all it was definitely very effective, but there is definitely a difference with Prodigy. That clears up my mind over matter and just thinking it was a fluke and it being all in my head. That stuff definitely does work. Energy Drinks are NOT the Same as Quality Pre Workouts!! Now that I notice a difference I’ll probably use it more often for my workout days, but I still want to go some days without just to not have to depend on it for a great workout and high intensity. I started to recommend the supplement to other people in the gym and told them about the great pump you get for your workout. I’m still not a fan of pre workout supplements but the fact that this one is working I’m actually starting to like it. I can see it making a difference in my strength over time and possibly transforming my body if I wanted a change. Herve’s entire Prodigy Pre Workout Run is on his Author Page. Are you in Miami Beach? Then Get Fit with Herve! Find his PT Bio on PricePlow. 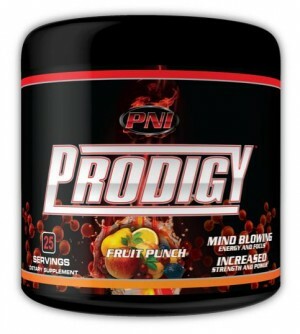 1 Comment | Posted in Supplement Logs | Tagged PNI, Pre Workout Supplements.